Two men are waging war against Indian myna birds, sometimes called flying rats and cane toads of the sky, which they say are a scourge on the Australian landscape. Peter Wiltshire, senior ranger at Darebin Parklands where he has spent 33 years, and Michael Mann, a volunteer and a member of the parkland’s friends group, are dedicated to spreading the message of the harm the bird is causing. They have spent years trying to rid Darebin Parklands of the Indian myna which drove the eastern rosella from the urban park. Mr Mann now lives at Hastings. His main involvement in the project is making nest boxes, trying to design myna-proof boxes, filming the pests’ behavior and trapping them. The pair recently made a presentation to the Southern Peninsula Flora and Fauna Association (SPIFFA). After the presentation, they made available a document detailing their early work in Darebin. In the document, Mr Wiltshire said he was always aware of the Indian myna scourge dominating the suburbs and fringes of Melbourne. As a result, he opposed unmonitored nest boxes in the urban setting which only encouraged the pests. But he wondered if the Indian myna was a factor in changes to the ecology and, as an individual species, had the ability to dominate and totally destroy bird ecology in the urban setting. “The difficulty in controlling this pest is huge,” Mr Wiltshire said. “It is a smart, tenacious species that is very territorial and vicious to all birds and animals it sees as a threat. “It carries mites and disease that can affect our native bird population. Mr Wiltshire’s interest was aroused in 2010 when he saw an eastern rosella flying through the park and realised he hadn’t seen the species for more than 15 years. The rosellas had disappeared from the park and Indian mynas had taken over. One problem was tractors mowing grass in the park. Mynas followed the tractors, feeding on exposed insects and skinks, in growing numbers. “The objective was quite simple – trap Indian mynas and install nest boxes to encourage eastern rosellas back to Darebin Parklands,” Mr Wiltshire said. Mr Mann started setting myna traps at various locations in the park and building nest boxes with barriers to prevent mynas easy access. In 2012, the two men monitored the nesting boxes and were delighted when eastern rosellas began using them. But their delight turned to horror when mynas invaded one of the boxes and they found two dead newly-hatched eastern rosella chicks at the base of the tree. “We didn’t actually see the mynas doing the crime, but you didn’t have to be Sherlock Holmes to deduce that these pesky birds were the culprits,” Mr Wiltshire said. In 2013, the same thing happened. Eastern rosellas raised two chicks but mynas attacked the parents trying to feed their chicks. Two chicks were found dead on the ground. “As if to rub our noses into it, the mynas established their own nest where the rosellas had been,” Mr Wiltshire said. Then in 2014, the two men had better luck. For the first time, rosellas raised three chicks in one of their nest boxes. The trapping program was working well with a daily yield of mynas being trapped, then humanely destroyed. “We generally had the support of the public although some trapped mynas had been released by some people who must have taken pity on seeing the birds in the trap,” Mr Wiltshire said. “Although annoyed at the time, we understood that people still dislike seeing animals trapped and felt passionate enough to release them. Also, it became apparent to the pair that mynas were much smarter and resourceful than they had anticipated. It reached a stage where the mynas could negotiate barriers on rosella boxes, but the rosellas could not work out how to get in. So Mr Mann set up security cameras on nest boxes to see how the barriers were being breached and to record general bird behaviour. Footage showed mynas were quick to learn and any external barriers installed did not deter them. They quickly worked out how to beat them, while most barriers deterred rosellas. 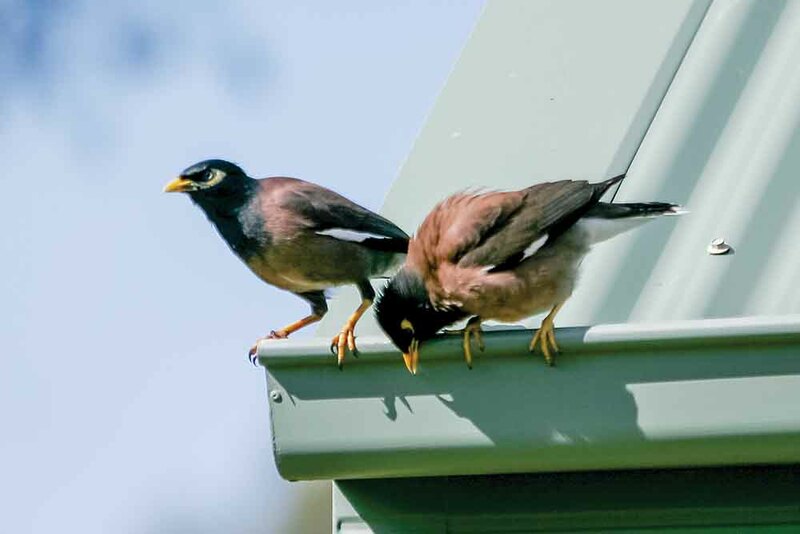 “We still haven’t given up on finding a myna-proof nest box, but it looks like whatever native birds can get into, mynas will persist until they can get in too,” Mr Wiltshire said. 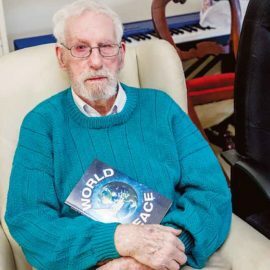 Mr Wiltshire said their observations had not been scientifically tested, researched or literature-reviewed but they believed their observations were significant and up-to-date evidence of what they had witnessed. In two years the men removed more than 800 mynas from the park and their absence, in large flocks, had been noticeable. Today Indian mynas are no longer a regular sight at the park with local residents up to 500m away observing a decline around their houses and streets. There are still mynas around but in much lower numbers and densities. Returning to the park are eastern rosellas, musk lorikeets, red rumped parrots, Australian noisy miners, pied currawongs, little ravens, kookaburras, mudlarks, crested pigeons and magpies. Returning species also include black faced cuckoo shrikes, sacred kingfishers, bronze winged pigeons and reed warblers. Willy wagtails, grey fantails, bell miners, brown goshawks, tawny frogmouths, red wattle birds and superb wrens seem to be at static numbers as before the myna program started. Some small native woodland species seem to have declined or disappeared with the mynas, including red brow fire tails, white plumed honey eaters, new Holland honey eaters, spotted pardalotes and silver eyes. “Why this is needs further study, but a quick analysis would be that the change of bird ecology and the increase in the likes of ravens and currawongs might have shifted the balance towards more robust species,” Mr Wiltshire said. Is there a solution to the Indian myna problem? 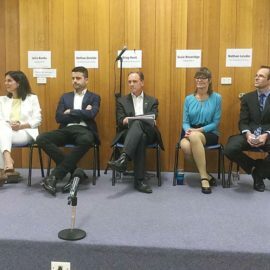 “Ideally, a biological control would best suit Australia but, with our track record, I doubt that can happen in time or effectively,” Mr Wiltshire said. Southwest Mornington Peninsula Landcare Group has an Indian myna trapping program running, supporting landholders to help control the pests on their land. The group provides information on how to build a trap, how to conduct a successful trapping program and state-approved techniques for humanely euthanising birds.